In 1842, the dam burst due to a fault in the construction, and the waters poured down to Bury causing widespread flooding in the vicinity of the Spread Eagle public house at Out Westgate. 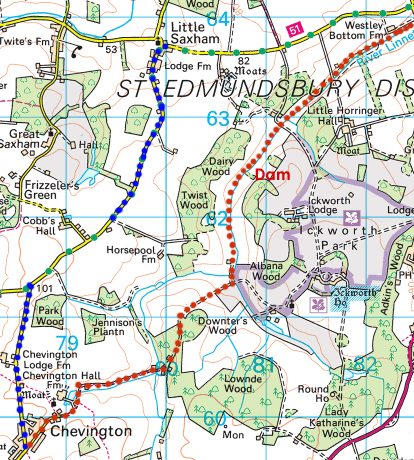 One source said that the dam was never rebuilt, but it was rebuilt as it is shown in Payne’s tithe map. There are also two undated plans from this time in the Suffolk Record Office which seem to be proposed alterations to the canal after its creation, one of which adds two islands that appear never to have been constructed. At some point late in the 19th century the dam broke again causing flooding in Bury (it is not uncommon even today for the Linnet to flood on the west side of the town). When exactly is not known, but the lake disappeared and the canal was not re-built. William Robinson, the horticulturist and writer, saw the lake in 1873, and it is shown, albeit hard to spot, on the 1885 Boundary Commissioners’ 4″ map of West Suffolk, but not on the 25″ OS map of the same year. A date in the early 1880s for the dam breaking seems likely. The 25″ map however shows the busted dam in great detail, and a path that seems to follow the waterline of the old lake, though today the path is alongside the river (detail from 25″ map above right). Zoë Ward wrote that ‘everyone said it served the Earl right, and that the bursting of the dam was an Act of God’ (this likely refers to the later bursting of the dam as this would have been in the living memory of her parents and other villagers). 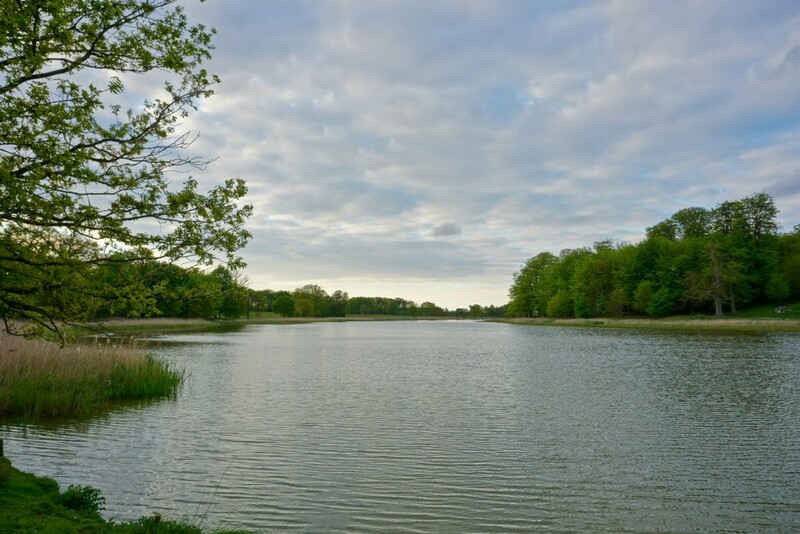 It is hard to find anything comparable across National Trust properties, but the 20 acre lake at Blickling Hall gives an idea of how the lost lake might have looked. There doesn’t seem to be any paintings or photographs of the lake. Up until the 1870s, there were very few landscape photographers; it was then technically very difficult to take photographs away from a studio. Even after that photographers would have been drawn to more distinctive and emotive locations. Nor is there any information about the wildlife in, on or around the lake. Perhaps further digging in the Ickworth archives may reveal something. Ickworth Park Lake is said to be the most significant lost feature in the park. Both the 1st Earl’s Canal Lake, created in 1717, and the Fairy Lake constructed in the 1870s for the 3rd Marquess, remain, but they are much smaller. Nothing has taken the place of the lake. The bed of the lake was never replanted and the arable fields are currently leased to a tenant farmer (photo below left). In 1957 both sides of the dam could still be seen with a gap in the middle where the dam was breached, but at some point after that, the bank of the dam on the west side was levelled and almost all traces of the dam on that side are now gone. 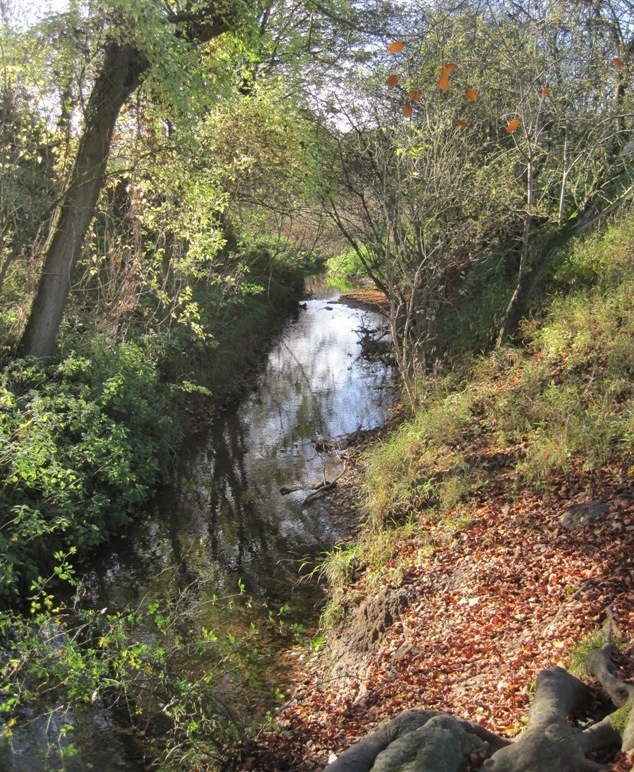 But on the east side, just downstream from the wooden footbridge over the Linnet, the dam still forms a steep bank overgrown with trees and shrubs (photo below right). One historical landscape specialist has said that there is a ‘good case for making a closer study of the New Canal and the desirability and feasibility of its reintroduction’.